In today’s technological landscape, printers and scanners play an important role in getting work done. Anything you need to print can be done by a home printer. Scanners enable you to scan photos and documents easily. Having a printer and scanner at home saves you the trouble of getting it done at a printing shop. There are numerous printers and scanners available in the market today, both online and offline. Given the huge number of choices, buying the right kind of printer or scanner can seem like a confusing task. This article gives you an insight into things you need to consider while buying printers and scanners. How much do you want to print or scan? This is the first question that you should ask yourself while buying a printer or a scanner. You should know what and how much you need to print and scan because there are printers and scanners available to squarely fit your needs. Color inkjet printers, which comprise a big chunk of the printing market, can print almost anything. You can print essays, glossy pictures, pie charts, whatever you can name! Some inkjet printers are also all-in-ones, and consist of a scanner as well, for you to scan your photos and documents. The print speed is pretty fast and they are close to their laser counterparts when it comes to features. 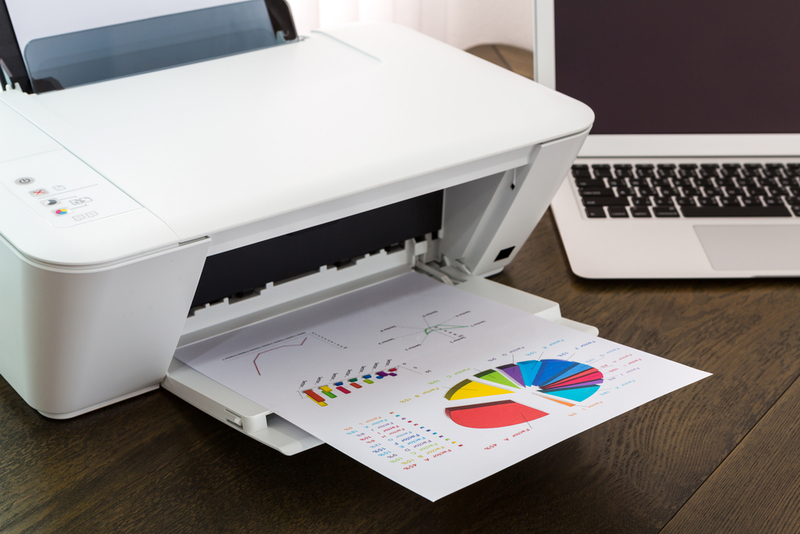 Laser printers are a good choice for an office setting, where the printing needs are mostly monochromatic. You can purchase monochrome laser printers too – they are available at quite affordable prices from reputed brands. These printers can print large volumes of material at a good speed. Sometimes, you can get prints at a lesser price per page than an inkjet printer. An interesting range of laser printers are the all-in-ones. The scanners that come along with the printers are also suited for scanning large volumes of material and are perfect for commercial use. While buying printers, research the supply costs. You need to know the expenses for replacing the ink cartridges. Certain companies may offer you printers and scanners at cheap prices because they can also rip you off when it comes to replacement and maintenance costs. Buy scanners from trusted companies, in order to rest assured of quality and durability. This way, you can save up on the costs of maintenance and premature repairs that may be needed. Preferably choose printers which enable you to choose your own cartridges. Doing so costs lesser than purchasing brand new cartridges each time. However, you need to make sure that the cartridges you use are of good quality, in order to optimize the performance of your printer. It is very important to check for warranty while purchasing electronic devices. Always buy printers and scanners from trusted and reputed brands, in order to get products of better quality. Buying printers and scanners that come with a warranty will save you the hassle of getting the device fixed for premature damages, and save you costs if such a need arises. Buy from well-known brands so that you can get a good service center for repairs and maintenance. Check out the wide range of offers, deals, and discounts on printers and scanners on multiple online platforms. Compare the prices of the products by different brands before zeroing down on the printer or scanner that you want to purchase. Keep track of the latest deals on printers and scanners on the official websites of the brands as well as in online stores and electronics blogs. Read consumer reviews online, in order to get a better understanding of printers and scanners of different brands. Assess your needs and budget and buy the printer, scanner, or all-in-one, whichever suits you best. Order a printer or a scanner online and have the product delivered to your doorstep.